Solid Maxi Skirts Only $12.99! You are here: Home / Great Deals / Solid Maxi Skirts Only $12.99! Don’t miss out on this hot summer wardrobe staple! 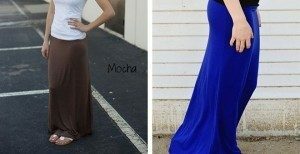 Solid Maxi Skirts Only $12.99! Choose from classic & trendy colors that will match your favorite wardrobe pieces perfectly. These are great for layering with a simple sweater or cardigan for an easy beautiful and comfortable summer outfit.